Episode 1 of RICHES Podcast Documentaries: Preview. RICHES Podcast Documentaries are short form narrative documentaries that explore Central Florida history and are locally produced. These podcasts can involve the participation or cooperation of local area partners. Episode 1 provides a preview of the project and excerpts of podcast interviews. A preview of the coming series with excerpt interviews. Original 11-minute and 19-second podcast by Robert A. Cassanello, January 1, 2011: "RICHES Podcast Documentaries, Episode 1: Preview." RICHES Podcast Documentaries, Orlando, Florida. 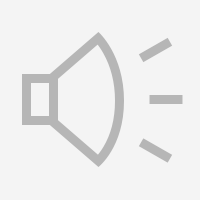 Digital typed transcript of original 11-minute and 19-second podcast by Robert A. Cassanello, January 1, 2011: "RICHES Podcast Documentaries, Episode 1: Preview." RICHES Podcast Documentaries, Orlando, Florida. I’m Robert Cassanello, Assistant Professor of History at the University of Central Florida, and you’re listening to the RICHES Documentary Podcasts. Welcome to the RICHES documentary podcast. RICHES—the Regional Initiative for Collecting the Histories, Experiences, and Stories of Central Florida—is an umbrella program, housing interdisciplinary public history projects that bring together different departments at the University of Central Florida with profit and nonprofit sectors of the community, in order to promote the collection and preservation of the region’s history. By facilitating research that records and presents the stories of communities, businesses, and institutions in Central Florida, RICHES seeks to provide the region with a deeper sense of its heritage. This series will feature a podcast every two weeks, in the middle and at the end of each month, that will explore various aspects of Central Florida history. In today’s episode, we have a preview of the upcoming podcast. We hope it will peak your interest and make you return to check out this exciting podcast series. When it opened, it was one of only two in the country where you could go and stay, that had rooms attached to it. That was pretty much a novelty. They advertised the hell out of it in the gay publications of the day. With so few options for people to go to, almost immediately, uh, the [Parliament] House [Resort] had people, you know people where coming from—from England and—and from France and Germany and other countries. I think [Harry T.] Moore was so very far ahead of his time. This is an amazing thing—that he was 10, 20, 30 years ahead of the rest of the country. He was saying things in the beginning of the 1930s, that Martin Luther King[, Jr.] would be saying 20 years later, and drawing national attention. He was challenging the system in an era where no one else was challenging the system. I lived about a block from the mainline for the Tavares and Gulf Railroad in Oakland. And my dad took me out to wave to the train. He loved trains, and he took me out to wave to the train each day, even before I could walk. So I’ve loved trains ever since. I guess you could say there are multiple paths to this job, um, but one of the biggest things is to get it into something that is going to give you some design experience, as well as the museum experience. People were just driving down Orange Blossom Trail. It worked to get people’s attention, but it also was so kitschy and eye-grabbing, that people wanted to take their picture in front of it. [Jack] Kerouac was, um, one of the great, so-called “beat” writers of the 1950s and ‘60s. His influence, um, kinda came at a time in post-World War II America, where people were looking to break out of the normal confines of the nuclear family. They welcomed[? ], beginning in the 1920s, more modernist style, and I think that’s what we see in the Cocoa post office design. Something that evokes the dignity of its public purpose and the security of, uh, the function that’s being carried out in the building—in this case, you know, the mail, right? But that really emphasizes function over ornate adornment. You don’t see a lot of adornment there—some nice touches, you know, the eagle [inaudible] the stars that are cast into the facade, but nothing really very grandiose. The story that Orlando was named for a Seminole War soldier named Orlando Reeves just will not go away [laughs]. Uh, the City [of Orlando] has continued to sort of enshrine it. I think there—there is a—a marker at this side of Lake Eola, at the east side, that was put up in the late 30s with money donated by school children or middle school children, uh, in the memory of Orlando Reeves. But there’s also another marker at the other end of Lake Eola, where the—the, the—put up by the city, I think, that that tells—at least mentions—uh, Orlando Reeves as the source of the name Orlando. Fifteen miles from where Lyndon [B.] Johnson—then president—was pressing the button to break ground onto the new cross water barge canal. They blew up a train and you could actually hear the explosion. And the people in Washington[, D.C.] said that this was the first and only time that a president ever threatened J. Edgar Hoover. Johnson got back to Washington, he called Hoover in, and he said, “I don’t care what pictures you have of who[sic] and I don’t care what you have on anybody.” He said, “You either get these guys or you’re out of a job.” And four men were arrested and charged with conspiracy to blow up a Florida East Coast [Railway] freight train. Each month in 1995, alumni presented programs highlighting several careers, such as law enforcement, politics, arts and literature, medicine, and military, and so forth. But I think one of the most dramatic changes was the integration of Jones High School in the early 70s. But one of the things that I like to tell people about it then, was I really disliked sometimes people sort of , uh, portray Orlando at that time as a—a sort of bumpkin little town where nothing happened. Whereas, in fact, it was small, but the downtown area was very active retail center. [inaudible] playing against Florida A&M [Agricultural and Mechanical University]. I got lucky and caught the [inaudible] pass and beat them eight to seven. And so I got drafted by the Pittsburgh Steelers and [inaudible]. Then I went Pittsburgh[, Pennsylvania] and stayed six years. And then I came to Bethune-Cookman [College] to work, because, over there, there’s program. That’s how I got started into the program as the employee. I came in here as the head football coach out there at the Ripton[?] [inaudible]. So they put the shoes on me, and got me squared away with them, and that helped me a great deal with the head coach, because my, uh—my coach brought me in. Alright. Well, right now, um, I work for the Institute for Simulation and Training here at UCF [University of Central Florida], and I do, uh, virtual heritage. Which is essentially, I take topics from any time period by—I specifically work from the 19—post-World War II topics—and we re-create items that are no longer there. Um, so, like the launch complexes at Cape Canaveral, we virtually recreate them. And my current endeavor is the 64-65 New York World’s Fair. So it’s really interesting, uh—look at history and, and also the unintended negative impact of those civil rights laws of the 1960s. Again, as wonderful and as necessary as they were, they really did have this—this unintended negative impact when, uh, some of the community leaders moved out. After African Americans were disenfranchised, political possibilities just kinda collapsed, and so communities really turned inward and just tried to sustain and survive as best as they could. African-American history is kinda a misnomer. African-American history is everyone’s history. It’s, it’s—it’s a part of American history, uh, that we should all be aware of. Thank you for listening to the RICHES Documentary Podcast. Feel free to contact us with any questions or comments on the program that you just heard. Please join us for the next episode, The Legacy of the Ocoee Riot[?] of 1920, that explores the long term impact of this event on Central Florida. 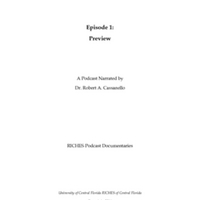 Cassanello, Robert A.. “RICHES Podcast Documentaries, Episode 1: Preview.” RICHES of Central Florida accessed April 25, 2019, https://richesmi.cah.ucf.edu/omeka/items/show/2453.